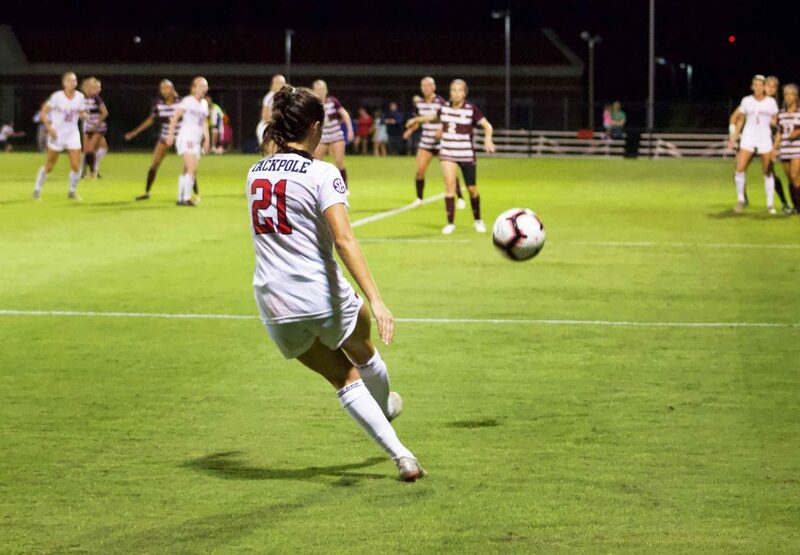 The Ole Miss soccer team travels to Lexington on Thursday for the final road match of the regular season against the Kentucky Wildcats, which is set to kick off at 6:30 p.m. The Rebels have three conference matches remaining in the season to improve their place in the standings and qualify for the SEC Tournament in Orange Beach, Alabama later this month. The Rebels have a special opportunity to gain three points against the Wildcats, who have yet to win a conference match and are ranked dead last in the conference at 0-7. Ole Miss currently sits in the middle of the pack in the SEC standings with a 3-3-1 record in conference play. After a big win over Arkansas at home, the Rebels fell to LSU 3-1 in Baton Rouge last week. The Rebels dominated the first half against LSU, taking the lead in the 12th minute off the foot of Channing Foster. The Tigers were able to come up with an equalizer two minutes into the second half with a penalty kick. The Tigers’ 11 shots on goal proved to be too much for the Ole Miss defensive line and freshman goalkeeper Morgan McAslan, making her first start for the Rebels in place of the injured Marnie Merritt. The team will look to bounce back against an inferior Kentucky team ahead of two challenging matches with No. 25 Mississippi State and No. 12 Vanderbilt to finish the regular season. Head coach Matt Mott said the Rebels will be careful not to underestimate the Wildcats. CeCe Kizer and the Ole Miss attack will look to create plenty of chances against a team that has allowed 41 goals this season. The match with Kentucky could serve as a final tune up before the Rebels face Mississippi State and Vanderbilt, both in Oxford, to wrap up the regular season. The Magnolia Bowl match against Mississippi State on Sunday is another game the Rebels will be fired up for. During his press conference on Monday, Mott encouraged fans to show up and support the team.